One of the hardest things to learn is how one’s effort translates into output. I don’t say finished product/paper/grant, because they seldom are. In the words of one of my most wonderful mentors: Scientific papers are never finished, they are merely abandoned to publication. The graph below is the best way I’ve come up with explaining this. First, energy into anything (be it making dinner or writing a grant) is never linear. Get over it. Some things have a huge start up cost in time (line A – pink with the flat start). Lots goes in, little comes out, till you hit a point where it takes off. This is learning MatLab. 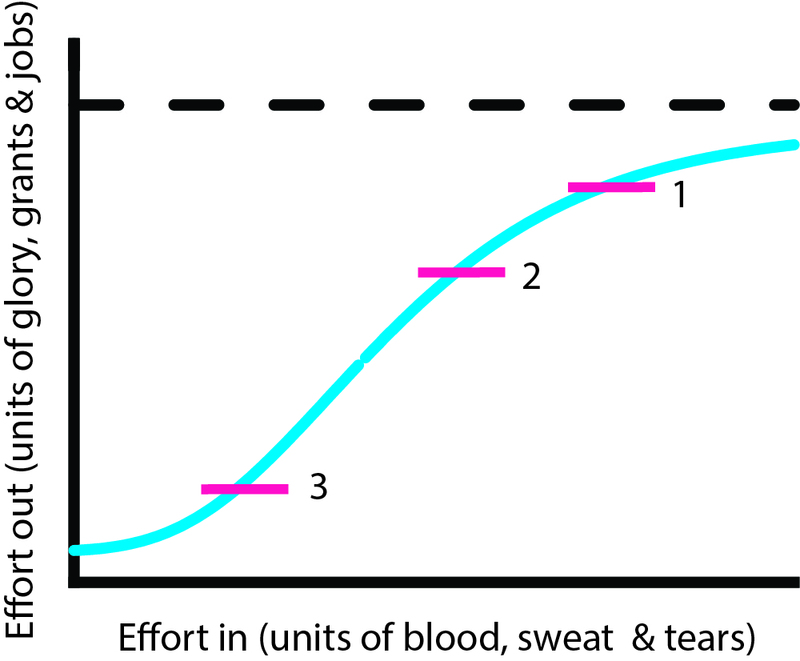 Some tasks have a more gradual rise, (line B, blue). This could be learning surgical techniques. Note this line takes forever to get close to the asymptote. There’s a reason its called an asymptote. One never quite reaches the black dotted line of perfection, 100%. Get over that, too. Other projects start going right away (line C, green), perhaps doing a different version of an experiment that has been done before. They rise gradually, but at any amount of effort in they have more out put than lines A&B. 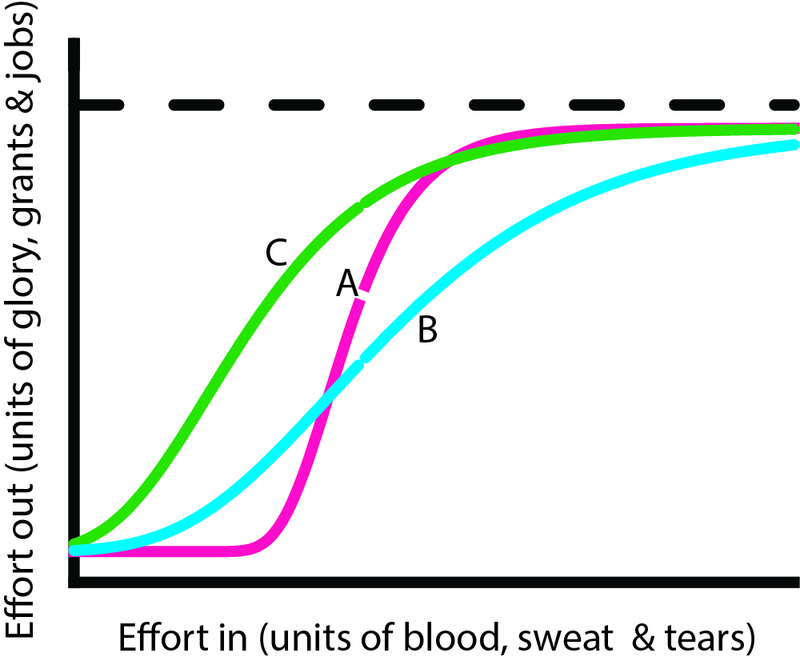 One critical point: where you stop on any of these curves is a function of what the task is, and its importance to you. If its a grant, trying for stopping point 1 on the graph is probably a good idea. If its an experimental technique, then being good enough (ie not killing the animal, getting a functional electrode in place), position 2 might be sufficient, that extra perfection will not impact on the results. Yes your stitching isn’t perfect, but does it need to be? In my view, committee work, picking out kid’s clothes for the day, or choosing a type of pencil, stopping point 3 is probably more than one needs. Did you show up, are they dressed and does it write? Of course there are pencil fanatics who would disagree, I’m sure. Which raises the final point: where one stops on this curve is an individual decision.But remember: if one tries to push everything to stopping point 1, nothing will reach that stopping point, and there will be lots of things stalled or finished at 3 that one would prefer were at least 2’s. I like this post a lot. One other point that I think is important is that these graphs are not always monotonic. It is possible to work yourself to death on something to the point where you are actually making more of a mess of things for your extra effort. Stopping (or taking a break) before that is important, but sadly that’s something that not everyone figures out. Mess also occurs when working with multiple authors whose suggestions contradict each other. You may have to expend even more units of blood, sweat and tears to make everyone happy, just to reach the same goal. I have some reservations with regards to the relationship between learning a surgical technique (line B) and output. It depends on the definition of output. Surgeons put so much effort initially, but after a certain point of training, the output (if it’s jobs, income, or glory) is actually very high. I think it should be higher than either A or C.
“Scientific papers are never finished, they are merely abandoned to publication.” Such an excellent quote! I have to ask: are you paraphrasing, and if not, who coined the phrase? I know with exactly how bad the elements is outside now i’m not receiving started on all tasks similar to this, in the event that soon.